Olive oil is one of the most common base oils used in soap making today. One hundred percent olive oil soap, or “Castile” soap has been made for centuries – and today, soap makers of all types usually include at least some olive oil in their recipes. It makes a nice hard bar of soap, is mild, and in combination with other oils, makes a nice dense lather. But what sort of olive oil is right to use in soap? There are several grades of olive oil, and while all of them will make good soap, some soapmakers prefer one over the other. 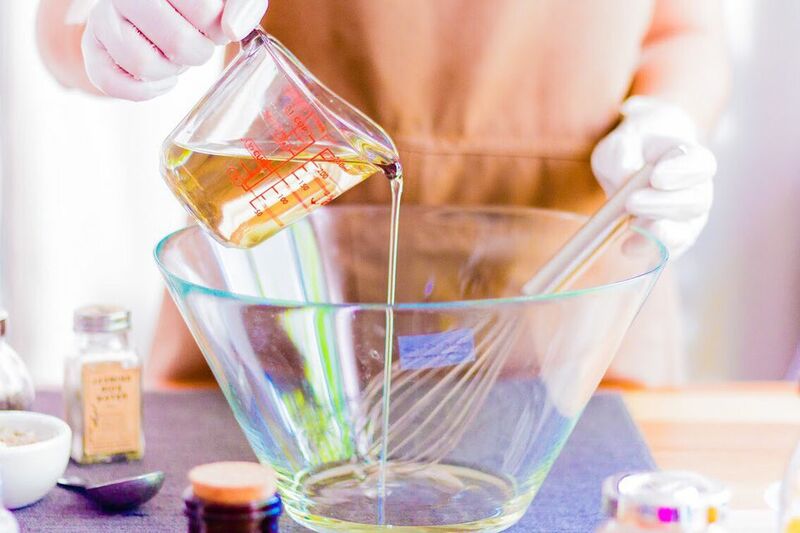 The differences in the grades of oil correspond to when in the extraction and refining process the oil is bottled, and these differences affect the final soap making process. Olives are a type of fruit called a drupe which is basically a type of fleshy fruit that has one hard pit/seed at the center. First, the olives are crushed and ground into a paste. Then, the oil is separated from the paste by various methods. The first oil that comes from the very first crush is the “virgin” olive oil. The paste that is left behind after the first extraction is called “pomace.” The pomace contains the ground skins, pits, flesh, and a little bit of oil. Chemical extraction is used to get the last bit of oil out of the pomace. It must be produced only by mechanical extraction (no hot water or chemicals applied to extract the oil from the olives). It must come from the first pressing of the olives. It must have a free oleic acidity level of less than one percent. Note: The “free acidity” level shouldn’t be confused with the overall fatty acid makeup of the oil. Olive oil generally contains between 60% and 80% oleic acid – what qualifies and olive oil as “extra virgin” is the low amount of “free fatty acids”. Virgin Olive Oil: Virgin olive oil also comes from the first pressing of the olives and also must be extracted without chemicals. Virgin olive oil can have a free acidity level of up to 3.3%, though. Pure Olive Oil: Sometimes also called “Grade A” olive oil, this grade of oil is a blend of virgin olive oil and refined oils. The refining process takes away some of the vitamins, nutrients, and flavor of the oil, but the blending provides a more stable, consistent, oil. Grade A oil is the most commonly used for making soap. Pomace Olive Oil: Pomace olive oil comes from the dregs of the olive paste as the last drops of oil (between 5-8% of the total amount of oil in the olives) are extracted from the skins, pits and ground flesh of the olives. It generally has a much greener color and is not as clear as virgin olive oil. It doesn’t have the flavor that virgin olive oils have, so it is mostly (to our benefit) relegated to industrial and soap making uses. But that’s fine because it still has largely the same fatty acid makeup of virgin olive oil, so other than the greenish color, it makes very similar soap. Which Olive Oil to Choose for Soap Making? Don’t worry too much about the grade of your olive oil. All of the grades of olive oil have predominantly the same fatty acid makeup, so each of them is going to make very similar soap. Most soap makers I know buy large bottles of “Refined,” “Grade A” or “Pure” olive oil at the large discount stores. Other soap makers prefer pomace olive oil. Either can be purchased from online soap making suppliers like Columbus Foods or Bramble Berry. While generally more expensive, virgin or Grade A oils are lighter in color and more readily available than pomace olive oil. The lighter color makes for lighter soap. The greenish color of pomace oil can come through in the final soap. The Grade A oils can also be used for cooking, which pomace cannot. Pomace olive oil in your soap recipes is known to speed up the time it takes for the soap to get to trace. Some soap makers speculate that this has to do with the high amount of unsaponifiables in it (constituents that don’t react with the lye). Others speculate that it’s due to the chemicals used in the final extraction process. So whether you make pure “castile soap” or use olive oil in a basic soap recipe of your own, olive oil makes great, mild, moisturizing soap, and you’ll want to use it prominently in your recipes.